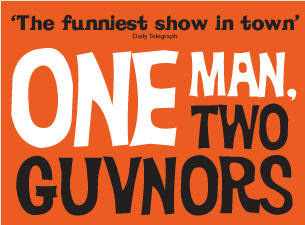 One Man, Two Guvnors is a play by Richard Bean which made its debut at the National Theatre in 2011. Following this it toured the UK and transferred to the West End’s Adelphi Theatre and then later at the Royal Haymarket Theatre. Since then the production has opened on Broadway and has launched its second tour which will make international stops. The play is a classic slapstick comedy, following the story of Francis Henshall who has been employed by two men, Roscoe Crabbe and Stanley Stubbers. Roscoe Crabbe was meant to have been killed by his twin sisters fiancé but he suddenly comes back to claim Pauline Crocker as his wife. Roscoe is of course his Twin Sister, Rachel Crabbe, in disguise. She is doing this so she can get money off Pauline’s father so she and Stanley (who killed her brother) can go to Australia and hide away from the police. I don’t personally like slapstick comedy as I get bored of it after two minutes however this play really brought it into the twenty first century and made it right for a modern audience, integrating audience interaction with the comedy. Richard Bean really knows who to write a comedy, he carried the humour throughout the whole show and he did it really well. At no point did I think ‘this is dragging on’ or ‘ok, next scene please’. A very talented writer. Nicholas Hytner’s direction is exceptional; he handles this production so well. The way he has modernised the slapstick comedy in the show is brilliant and is the key to what makes this show so funny. Mark Thompson’s design feels a little like it’s a budget touring productions set but I can’t deny that it works for this production. Rufus Hound stars as Francis Henshall in this production (previously James Cordon and Owain Arthur), as an actor he’s not the best. In fact, when he did a few of the monologues I felt like I was watching a bad actor in Panto but what really makes his performance good in the show is his charisma he has within the audience interaction. Being a comedian he’s very quick witted and is absolutely hilarious. Kelly Price plays Dolly in the show and she really bounces off the other characters well, her attitude in the role was a nice contrast to the other people on stage. Rhona Croker was by far my favourite thing about this production, a hilarious portrayal of Pauline. Playing the comical dumb blonde perfectly; it’s like she was made for this role! Amy Cudden plays Rachel Crabbe and to be honest I wasn’t keen on her. At times I felt she blocked a lot of the comedy and didn’t respond to some of the other characters like she should have. I also saw very little difference when she changed between Rachel and Roscoe which confused me a little, I wish she was a little more girly as Rachel because that would have made it a little more clearer to the audience. Sam Alexander played Stanley Stubbers, he played it alright and his relationship with Frances was funny to watch but it felt like every movement he done was choreographed which felt a little boring to watch but he was still good in the role. Harry Kershaw played Alan Dangle in the play and he did the ‘actor’ type character perfectly didn’t lose his focus at any point in the show and really carried it through which really impressed me. Ian Burfield as Charlie Clech was the classic 60’s cockney dad, looked the part and acted it really well. Hugh Sachs and Derek Elroy, I didn’t actually see the point of them in the show. I can’t even remember what they did! I’m surprised they haven’t been cut to save money on salaries, but maybe their characters have a really important meaning within the plot, I obviously missed it though! In this production before the show starts and while the set was being changed behind the curtain you get the pleasure of watching ‘The Craze’ perform. I think it’s to get you in the 1960’s mood and it certainly did that! Consisting of a lead singer and a 3 piece band all playing different instruments it really is a nice way of breaking up the performance and it really is nice to have them perform for 15 minutes or so before the show. Although they were quite loud so when you’re trying to settle in your seat and have a little chat with the person you’ve gone with you end up trying to over them. However they were brilliant, especially the lead singer who was Josh Sneesby on the night I was there. Helps he was nice on the eye (#hotgingeroftheday). Overall the show was good, I enjoyed it. It wouldn’t be something I’d necessarily go and see again because I'd know what was coming and the funny parts wouldn't be funny a second time but it’s still a good play. I’d recommend it to people if they want a play where they can go and laugh a lot (especially at the end of act 1... I actually felt tears on my face). It’s a funny show with a good cast but I wouldn’t tell you to rush to get a ticket any time soon. Cast Includes: Kelly Price, Derek Elroy, Ian Burdfield, Rhona Croker, Hugh Sachs, Harry Kershaw, Rufus Hound, Amy Cudden, Sam Alexander, David Benson, Martin Barrass, Mensah Bediako, Owen Brazendale, Gillian Budd, Max Hutchinson, Tom Lorcan, Aimee Parkes, Claire Sudin, Tom Green, Josh Sneesby, Bryan Smith, Richard Coughlan and Benjamin Brooker.